The validity of video games as an art form has long been questioned in our society. The Artcade is a collaborative event that seeks to celebrate the hard work, time, and creativity that goes in to making each aspect of a video game. This one day exhibit will feature the artistic evolution of gaming through four levels of interactive art and gaming. These sections of art you can play will discuss and demonstrate the value in game graphics, narratives, music, and gameplay. Interactions will include speed-runs of award winning games, exemplary games for participants to play, and artistic and musical behind the scenes features. 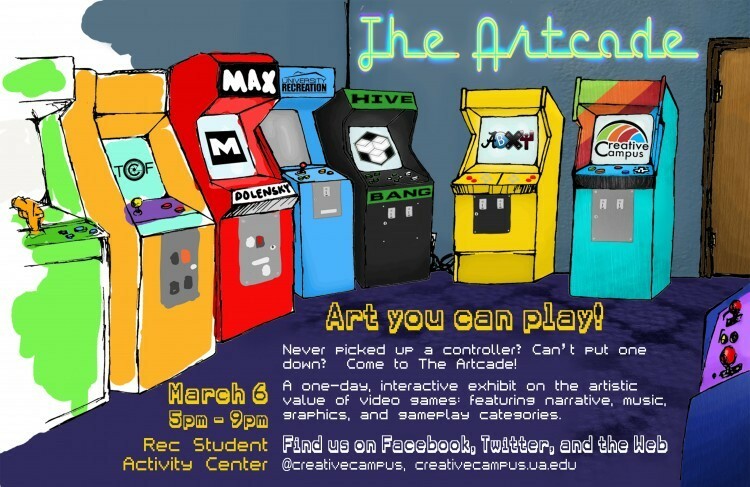 The Artcade will be free to play on Thursday, March 6, 2014 from 5-9 pm in the UA Rec Student Activity Center.